"You know me. I never sleep." That's a dark quote from Amy Adams in Nocturnal Animals, one of the best thrillers of the century. The film is based on the 1993 novel Tony & Susan by Austin Wright. Adams plays Susan Morrow, an art gallery owner in Los Angeles. Her life seems perfect with her husband, Hutton (played by Armie Hammer), but things are not what they seem. Susan's life is troubled, Hutton is cheating on her, & Susan's first husband, Edward Sheffield (played by Jake Gyllenhaal) has sent her a manuscript of his new book, Nocturnal Animals, the title being very familiar to Susan, as Edward used to call her a "nocturnal animal." The book tells the story of Tony Hastings (also played by Jake Gyllenhaal), whose family is disturbingly harassed & attacked by three troublemakers during a night road trip in West Texas: Ray Marcus (played by Aaron Taylor-Johnson); Lou (played by Karl Glusman); & Turk (played by Robert Aramayo). Tony's wife, Laura (played by Isla Fisher), & his daughter, India (played by Ellie Bamber) are viciously raped & killed by the three troublemakers. Tony becomes guilt-ridden after this, & seeks help from Det. Bobby Andes (played by Michael Shannon) to get vicious revenge against the killers. Susan, disturbed by the content of the novel, has flashbacks about her relationship with Edward, falling in love with him at first sight, despite her mother, Anne Sutton (played by Laura Linney) asking Susan not to marry her, warning that the things she loves about him now are what she will hate later. Susan goes on with the marriage anyway. But Susan does something that will change everything. The cast is spectacular, especially Michael Shannon, who is the best actor out there today. 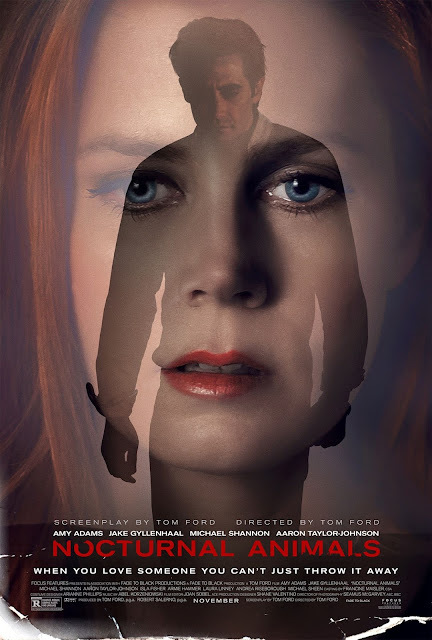 Tom Ford's direction & screenplay is brilliant, building off of his brilliant filmmaking debut, 2009's A Single Man. Joan Sole's editing is excellent. Seamus McGarvey's cinematography is amazing, with a series of excellent shots of the wide-open Texas landscape & the Los Angeles skyline. The costume design, production design, & makeup & hairstyling are all excellent. And Abel Korzeniowski's dark & disturbing film score is nothing short of excellent. This is one of the best films of the year.